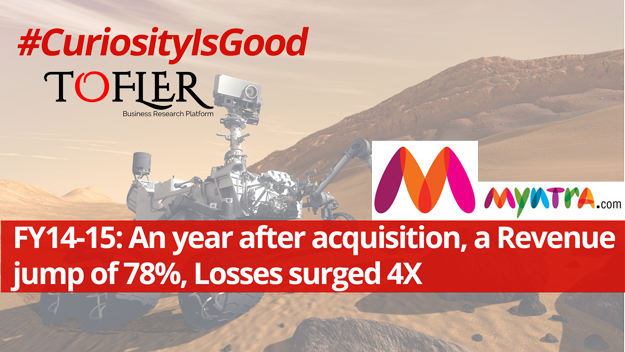 Myntra, which got acquired by Flipkart in May, 2014 has reported revenue figures of INR 773 crores against a loss of INR 740 crores for FY 14-15. Myntra is one of the leading fashion e-commerce portal in India and competes with the likes of Jabong, Fashion and You among others. Myntra is owned and operated by Myntra Designs Private Limited. The company reported a revenue growth of 78%, its revenue stood at INR 773 crores in FY 14-15 vis-à-vis INR 433 crores in FY 13-14. The losses surged more than four folds from INR 173 crores in FY 13-14 to INR 740 crores in FY 14-15. In comparison, Jabong had reported a revenue of INR 1083 crores with a loss of INR 44 crores in the same period. Myntra operates on an inventory-led model, and recognizes its revenue from the sale of goods through the website and the mobile app. It also realizes revenue from the technology solution services from operating the internet portal in the form of brand name license fees, technology license fees, domain name fees and service fees. Its revenue from operations was 96% of the total revenue. The major expenses for the company as a percentage of the total expenses were purchase of stock-in-trade at 72%, Employee expense at 14% and advertising promotional expenses at 11%. The company has raised a total funding of INR 1831 crores. However, the major funding came post acquisition when the company saw major investments from Flipkart of INR 1160 crores during June 2014 to June 2015. Myntra was founded by Mukesh Bansal, Ashutosh Lawania and Vineet Saxena in 2007. It is an online e-commerce platform for fashion and lifestyle products including clothes, apparels and footwear and operates through an app-only model. Myntra, which specializes in fashion e-commerce, competes directly with Jabong, Yepme, Fashion and You and Limeroad in its category and indirectly with other E-commerce giants like Snapdeal and Amazon. Myntra initially operated on a B2B model for on-demand personalization of gift items. In 2011 they shifted their focus on fashion and lifestyle products. In 2014, Myntra got acquired by Flipkart to keep players like Amazon and Snapdeal at bay. Founder and CEO, Mukesh Bansal, now heads Flipkart’s commerce platform and the ads business. 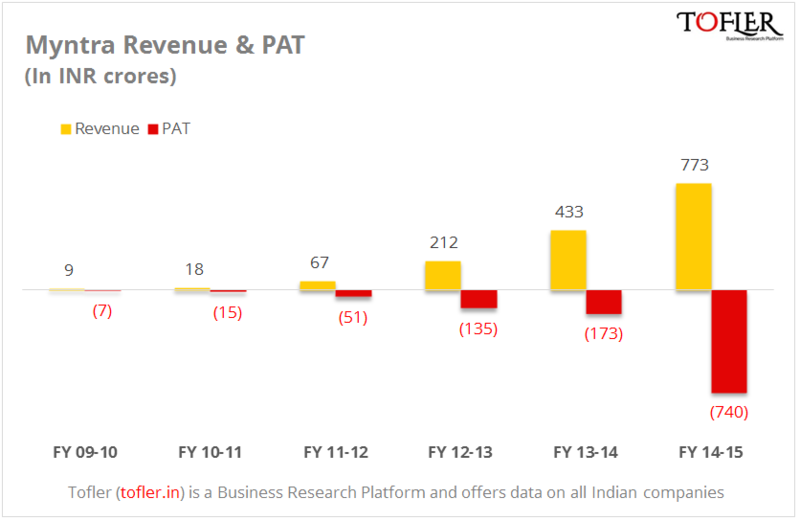 Myntra went app-only in May 2015but it seems that they have seen a decline in sales due to that. They recently announced that they clocked an annualized Gross Merchandise Value (GMV) of USD 800 million in January 2016 and are focusing on attaining positive gross profit and touching USD 1 Billion gross profit this year.